Dr Rebekah is a co-owner of the practice and she is pictured with one of her Rhodesian Ridgebacks named "Georgie". She graduated from the University of Queensland in 1998 and has studied as a post graduate in Australia and overseas. She has a keen interest in soft tissue surgery and orthopaedic surgery and oncology. In her spare time she enjoys horse riding and spending time with her pack of dogs. Dr Terry, originally from Malaysia graduated from the university of Adelaide in 2016. He has a strong interest in small animal medicine and he hopes to specialise in that file one day. During his free time he enjoys a stroll down the Gawler main street and having a coffee - black and extra strong! Hayley began veterinary nursing in 1999 she has worked in several practices throughout South Australia and spent a year working in the UK. 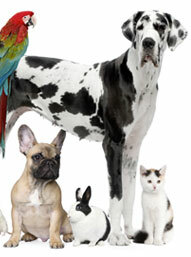 She has certificate IV vet nursing qualification and has over 15 years' experience. She co-owns the practice with Rebekah and her role within the clinic includes a combination of practice management, veterinary nursing and time on reception. When not at work Hayley is busy chasing after her two sons Archer and Casper. In her spare time she enjoys camping and travelling with the family, showing and sled dog racing her Alaskan Malamutes. She is pictured with her Multi Best In Show winning dog "Lennox". Naomi is pictured with her cat Polo and her Siberian Husky Satine. She joined the Animalia team in 2008 and is a qualified Veterinary Nurse and is also the puppy pre-school coordinator. She has a huge love for both cats and dogs owning three of each and is often a foster carer for sick or injured wild life and stray or orphaned kittens. In her spare time she enjoys taking her dogs to the beach and watching movies. Dr Kelly graduated from Melbourne University in 2004 and has worked in both mixed and small animal practice. She lives in the Clare Valley with her husband, 3 kids and a crazy Ragdoll cat called "Tonka". In her spare time she enjoys swimming, mountain bike riding and caravanning with her family. Caitlan is pictured with her Staffy Tarrant. She joined the Animalia team in 2010 working part time while at school and after finishing school in 2012 she started working full time and studied to complete her veterinary nursing qualification. In her spare time she enjoys riding her horse Ned, spending time with her family and watching the AFL. Rhiannon is pictured with her Blue Heeler Harley. She joined the practice in 2014 and is a qualified Veterinary Nurse. She has a keen interest in frogs and turtles and owns a turtle called Nelson. In her spare time she enjoys cooking and baking and spending time with her two dogs Harley and Belle. In the winter months she plays soccer to burn off energy. Sharon is the clinics book keeper and is mostly tucked away in the office hard at work. She started out with us when we first purchased the clinic in November 2005. When she is not hard at work Sharon enjoys spending time with her husband and two daughters, their GAP greyhound Ella and Maltese / Shih Tzu Molly. Laura works part time and joined our team in March 2014. She has been Veterinary nursing for over 15 years and has an interest in wild life and fauna rescue. When not at work Laura is busy with her large family, her three dogs, Archie, Buddy, Chewy, five cats, Peanut, Gingy, Izzy, Smokey and Robbie. She also has a passion for Quarter Horses and enjoys competing in Western Pleasure and Western Trail events. Pepper is our very cheeky clinic cat she joined our team in 2013 and she loves pats and cuddles from everyone who comes in to our clinic. If you leave your lunch unguarded she will definitely help you eat it or try to steal it.